I know I have found a favorite insert when I have used it for more than three weeks in a row. This insert is a favorite. It has room in the weekly blocks to jot down bills due, important dates, and upcoming appointments. There is not room for task lists, which I often do when using a week on two pages spread. 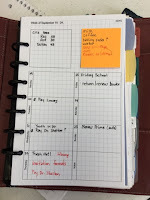 If I have a very busy day, I use a daily page for notes and reminders, or I will use a to-do app on my phone. There are two blank blocks at the top of the page. I use the one on the left to record financial information. In the block above are upcoming homeschool fees. Sometimes I will keep our checking balance in the block, or write outstanding check amounts (or both). 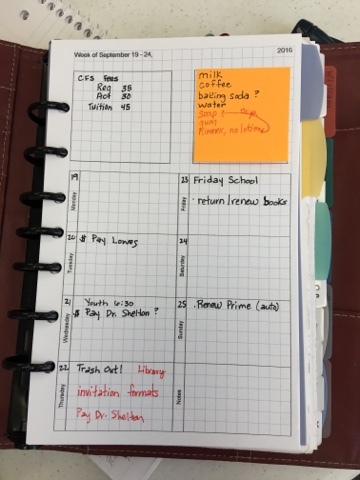 The right block perfectly fits my sticky notes (I might have planned that), and I am currently using that as a list that I add to during the week when I find something we need on our next shopping trip. If you would like a copy, you can download HERE.